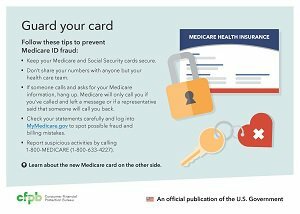 Medicare ID fraud happens when someone uses your Medicare card to get your personal information, like your Social Security or Medicare ID number. A fraudster could steal your identity to open new credit cards or bank accounts using your name and credit. They also could use your Medicare ID card information to file fake claims for healthcare you did not receive—like billing for a motorized scooter that you don’t need. wastes a lot of money each year and results in higher health care costs for everyone. Check your statements carefully and log into to spot possible fraud and billing mistakes. Report any suspected fraud to your law enforcement’s non-emergency number. If you suspect that someone is a victim of elder abuse or financial exploitation, also report it to Adult Protective Services (APS). Find your local APS at . If you think the person’s safety may be at risk, call 911. Report Medicare fraud by calling 1-800-MEDICARE or through the Office of the Inspector General for the Department of Health and Human Services.